A new build residential scheme on the edges of Primrose Hill for the Linton Group. The site occupies a corner plot, currently occupied by three outdated and dilapidated townhouses. The area itself is characterised by large blocks of residential units bordering the adjacent parks in a variety of architectural styles. Sitting within a complicated rights of light envelope and surrounded by buildings of varying scales a series of steps have been employed to mediate between the 2 storey terrace houses of Well’s Rise and the larger blocks on St. Edmund’s Terrace. 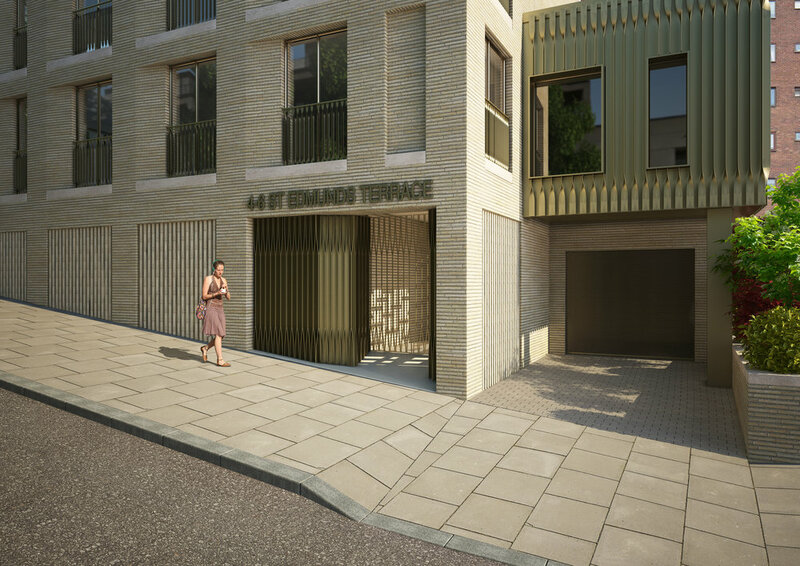 Following pre-application advice from Westminster Council, steps were taken to realign the mass of the building with the original terrace line, providing a unified frontage to St Edmund’s Terrace. Basement levels are used for car parking accessed from street level via a car lift. Alluding to the mansard roofs of nearby buildings the top floor is clad in metalwork, while the lower levels are clad in a high quality long format brick in keeping with traditional London masonry.